Above: Arthur’s ‘Hilton Residence’ in Florida, USA. If you like the amazing homes in the James Bond movies, dream of Tony Starks ‘Iron man’ house, or simply want to live in a breathtaking home, then Asetti is that brand. This international team of eclectic architects and designers turn architecture into art and give clients, ideal movie style homes, unsurpassed anywhere in the world. They think out of the box, bring new meaning to the word ‘wow” and have developed a luxury name on a par with any super yacht designer. It could be a minimalist house in England, a tropical villa in the West Indies or a modern luxury super home in California. If you seek the best, then Asetti are the designers to provide it. Founded by international luxury designer Chris Clayton, Asetti has a wonderful new addition, with a new partner and senior architect in the way of legend Arthur Dyson. One of the only architects to have been under the tutelage of legendary American architect Frank Lloyd Wright, gaining further recognition with 200 architectural awards including the American Institute of Architects (AIA), Presidential Award (2006) and The Lifetime Achievement Award (2014). With Arthur’s unsurpassed experience and Chris’s exceptional creative abilities, Asetti are the perfect dream team. They share a common goal and that is to create stylish homes of worldwide significance, genuine beauty and timeless luxury. To bestow upon the client a unique work of art and a beautiful home, they love to live in; a luxury home that was created with loving care and dedication to perfection. The clients see it, they feel it and they know it. It is an Asetti design and a design that only Asetti can create. This is the ethos of Asetti. Recent super house designs include the amazing ‘Atlantis’. 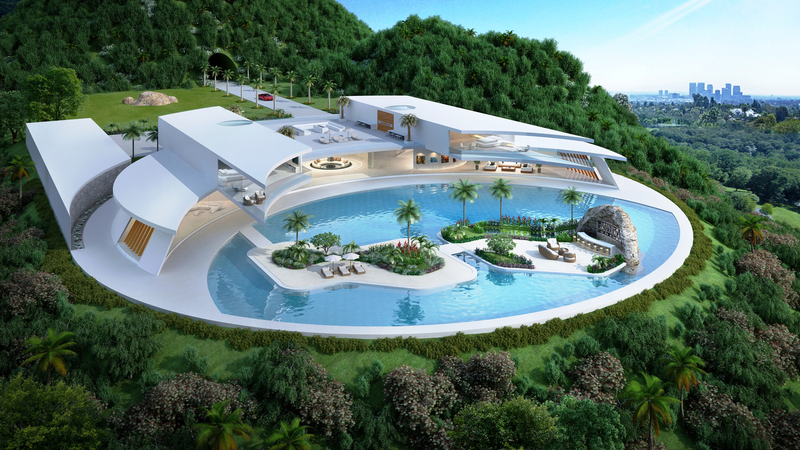 An incredible 5,000 sqm (53,819.55 sq.ft) luxury super home. Briana James in the Premier Luxury Lifestyle Magazine ‘Dolce Vita Diamond’, called it the most beautiful house design in the world today. It comes with 10 Presidential suites, a boat dock under the home and a whole myriad of luxury features. Simply overflows with the ‘wow’ factor. What makes Asetti’s designs so fascinating is the depth to which they research and craft the end result. The passion and imagination that goes into each one is mind blowing. You are not only getting a unique architectural design, but one that pushes the levels to whole new artistic heights. They literally have, taken home design, turned the industry on its head and created a whole new level of luxury lifestyle. By doing this, they have turned architecture into art and invented the super home. Arthur’s Stunning ‘Hilton Residence’ in Florida, is one of the truly great examples of organic design in the world today. Photographs courtesy of David Swann. Thank you so much for providing individuals with remarkably breathtaking opportunity to read critical reviews from this site. nearly 3 times in 7 days to read the newest stuff you will have. are unequivocally the most impressive I’ve ever had.